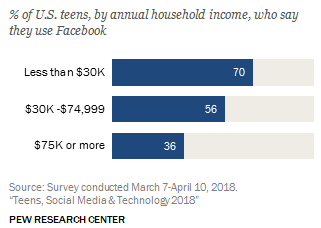 A Pew survey of teens and the ways they use technology finds that kids have largely ditched Facebook for the visually stimulating alternatives of Snapchat, YouTube and Instagram. Nearly half said they’re online “almost constantly,” which will probably be used as a source of FUD, but really is just fine. Even teens, bless their honest little hearts, have doubts about whether social media is good or evil. The survey is the first by Pew since 2015, and plenty has changed. The one that has driven the most change seems to be the ubiquity and power of smartphones, which 95 percent of respondents said they had access to. Fewer, especially among lower income families, had laptops and desktops. This mobile-native cohort has opted for mobile-native content and apps, which means highly visual and easily browsable. That’s much more the style on the top three apps: YouTube takes first place with 85 percent reporting they use it, then Instagram at 72 percent, and Snapchat at 69. Facebook, at 51 percent, is a far cry from the 71 percent who used it back in 2015, when it was top of the heap by far. Interestingly, the 51 percent average is not representative of any of the income groups polled; 36 percent of higher income households used it, while 70 percent of teens from lower income households did. Twice as many teens reported being “online constantly,” but really, it’s hard to say when any of us is truly “offline.” Teens aren’t literally looking at their phones all day, much as that may seem to be the case, but they — and the rest of us — are rarely more than a second or two away from checking messages, looking something up and so on. I’m surprised the “constantly” number isn’t higher, honestly. Gaming is still dominated by males, almost all of whom play in some fashion, but 83 percent of teen girls also said they gamed, so the gap is closing. When asked whether social media had a positive or negative effect, teens were split. They valued it for connecting with friends and family, finding news and information and meeting new people. But they decried its use in bullying and spreading rumors, its complicated effect on in-person relationships and how it distracts from and distorts real life. Here are some quotes from real teens demonstrating real insight. That last one is scary. You can read the rest of the report and scrutinize Pew’s methodology here.